The stock market – where shares in profit-making companies are exchanged – went up again on Friday. Does this mean the outlook for making money is improving? Does this presage higher dividends for the stockholders? What, exactly, do investors expect? DJIA, daily. Recently the stock market has been stuck in a trading range, but last week the market went up on three days, including Friday. There seems to be a lot of complacency, which seems not exactly warranted – click to enlarge. The Fed is supposed to be non-political. Yet here is a Fed governor angling for a job in the next Democratic administration. In the run-up to the presidential election, mightn’t she be inclined to keep stock prices high and interest rates low? Mightn’t she be tempted to want to give her next boss a little boost? What steel strengthens her backbone, lest she bend to pick up the lure? What wax fills her ears, lest she hear the sirens’ call? Bloomberg reports an exchange on the subject between Republican Congressman Scott Garret and Ms. Yellen. “Yellen cornered by lawmaker in heated exchange over Fed politics,” reads the headline. The press focuses on the “politics” between Democrats and Republicans and the potential conflict of interest involved: The Fed can cause a boom or a bust, thereby favoring one candidate or the other. 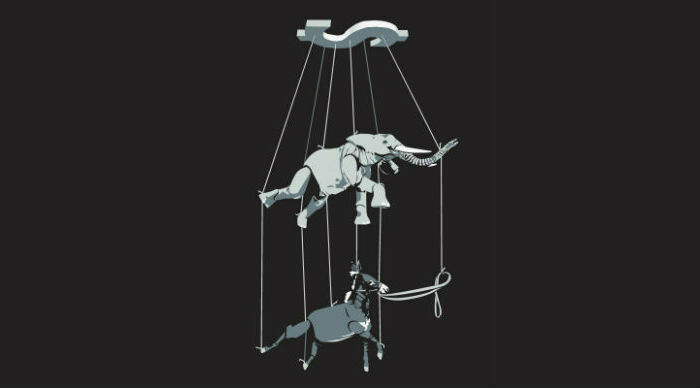 But there’s a far deeper conflict of interest that the press has missed: Democrats and Republicans share the same bias. It is the Fed’s bias, too – an abiding prejudice towards the Deep State. If the Fed were really apolitical, it wouldn’t care if stock prices went up or down. Nor would it care what interest rates borrowers were paying. It would stand back and let willing buyers and sellers discover prices on their own. After all, that’s the way markets work: always rewarding success and correcting mistakes. A market that does not correct is like a bathtub without a drain. It fills up with errors, misallocations, zombies, and cronies – all floating on the surface, like scum. Honest central banks are supposed to keep their distance from politics – and let the tubs drain. They are supposed to be impartial… and not just between Republicans and Democrats. They are not meant to favor buyers over sellers of stocks, or borrowers over lenders, or labor over capital. They are meant to protect the realm’s money and nothing more. Even if “protecting the realm’s money” had remained their only job, they couldn’t have botched it more thoroughly if they had tried. The utterly absurd belief that inflation somehow “creates jobs” has helped to accelerate the process – click to enlarge. The Humphrey-Hawkins Act of 1978 expanded the Fed’s job, charging it with maintaining full employment, too. The Fed shouldered this new responsibility with the lusty enthusiasm of Paris carrying away Helen of Troy: It was bound to cause trouble, but it might be fun. It was (and still is) widely believed that the way to add jobs was to destroy the value of the nation’s money. This the Fed has done with gusto. Since 1971, when President Nixon ended the last vestiges of the gold standard, the dollar has lost 80% of its buying power. Now, the Fed has no intention of letting “sound money” get in its way. The current system suppresses markets in order to deliver trillions of greasy dollars to Deep State cronies. That’s the whole idea: to avoid corrections and keep the money flowing. And protecting the system – a scam based on a fake dollar, fake interest rates, fake stock prices, fake statistics, and a fake economy – is the Fed’s No. 1 concern. 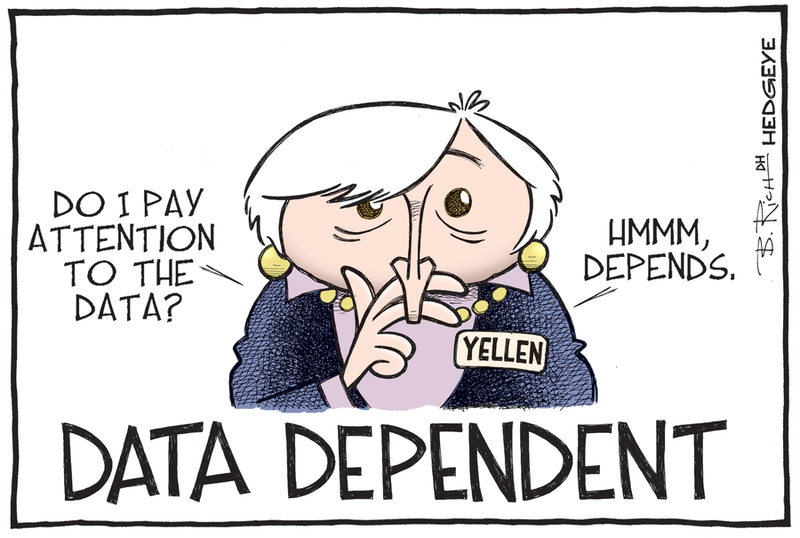 That’s why it is “data dependent”; an honest Fed wouldn’t care about data. That’s why it hesitates to raise rates; an honest Fed wouldn’t have lowered them in the first place. That is why it watches over the way the cards are dealt so carefully; it needs to make sure the right players get the aces! The Fed practically created the swindle. Today, it manages the hustle to keep the wealth flowing. That, much more than favoring one party over another, is the Fed’s conflict of interest: Between markets and politics, it favors politics. For the good of the nation? Hardly. Since the market bottomed in 2009, savers have lost $10 trillion. Creditors have gained (at least on paper) far more. Household wealth is up $33 trillion in the U.S. (most of it in the households of the rich). Growth is down. Productivity is down. Wages are down for most people. The Fed has acted in favor of the few and to the detriment of the many. It, along with its employees, bosses, cronies, and drinking buddies, is firmly ensconced among the “One Percent” of the Washington-Manhattan axis. Rather than recognize any “conflict of interest,” it ignores its own biases in order to keep the racket going. Reprinted with permission from Acting Man.